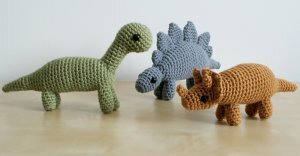 Three original crochet amigurumi dinosaur patterns (Brachiosaurus, Stegosaurus, Triceratops) from the Dinosaur range by June Gilbank. Brachiosaurus was one of the tallest and longest dinosaurs, at 85 ft long. It was a herbivore from the Jurassic period and it was so large that it had no predators. Unlike most dinosaurs, its front legs were longer than its hind legs. Stegosaurus was a 30-ft long herbivore from the late Jurassic period. It was easily recognisable by the large triangular plates along its back. Triceratops was a 30 ft herbivore from the late Cretaceous period. Its name means 'three-horned head' and, as well as those horns, it was recognisable by its distinctive bony neck frill. Purchase Dinosaurs Set 1 (includes Brachiosaurus, Stegosaurus, Triceratops patterns) together and SAVE. Note: Take advantage of even more savings when you buy these patterns together with their Expansion Packs, as part of the Dinosaurs Sets 1 and 1X multipack! Date Added: 08/04/2015 by Katherine W.
Date Added: 05/13/2014 by Rebecca D.
Date Added: 05/01/2014 by Tiffany H.
Really easy set to follow and super awesome animals. I really enjoy the set. Date Added: 03/24/2012 by Holly G.
Date Added: 12/31/2011 by Rianne d.
Date Added: 01/31/2011 by Amber R.
Date Added: 10/12/2010 by Wendy W.